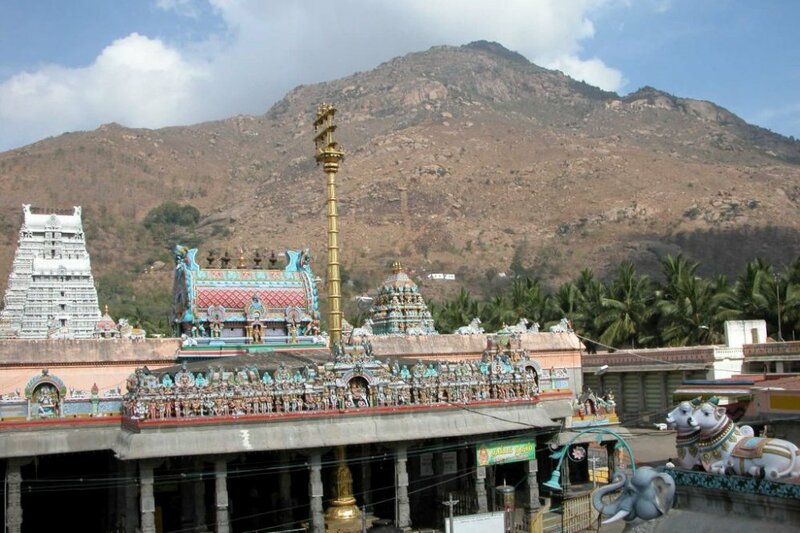 Stepping through the Kili Gopura directly in front is the 16 pillar Katchi Mandapam, where the panchamoorthies (five Gods) and Ardhanarishvara give darshan during Deepam Festival and from where the Lords may witness the light of the fire on the top of Arunachala. This Mandapam was built by Mangayakkarasi and her brother in 1202 A.D. Opposite this mandapam, there is the Bali Peedam (sacrificial altar), Nandi and the Flag Staff (dwajasthambam). This structure which has many pillars, is a beautiful gallery running round the inside of the walls of the Third Prakaram. Many enclosed and locked portions were erected in the modern era. 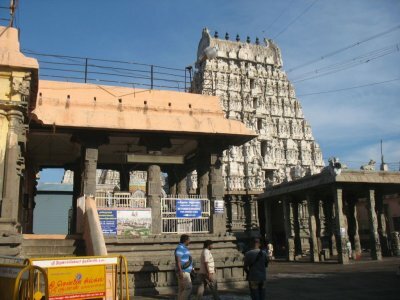 The south-east corner of this structure has been converted into kitchen temples, the south-west corner is occupied by the Kalayana Mandapam (Wedding Hall) and Bhimeshwara Shrine. This mandapam is used during certain Festivals, one of which is Vasantha Utsavam during which certain rituals are undertaken at the end of the Festival connected with the burning of Manmatha (God of Love). For more information go to this link here. The Banyan Tree is the sthala vriksha (assigned tree) of Arunachala and the tree that Arunagiri Yogi reportedly sat under. 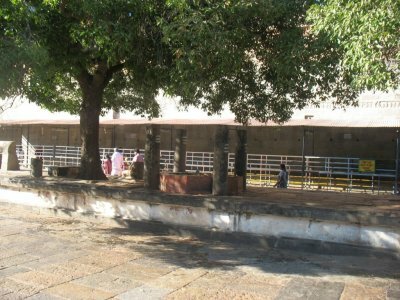 A young Banyan tree is located in the Fifth Prakara. Previously there was a Banyan Tree in the Third Compound but as the roots of that tree go very deep, to protect the structure of the Sannidhi, 3 Magizha trees (which have shallow roots) were planted in the Third Prakaram. 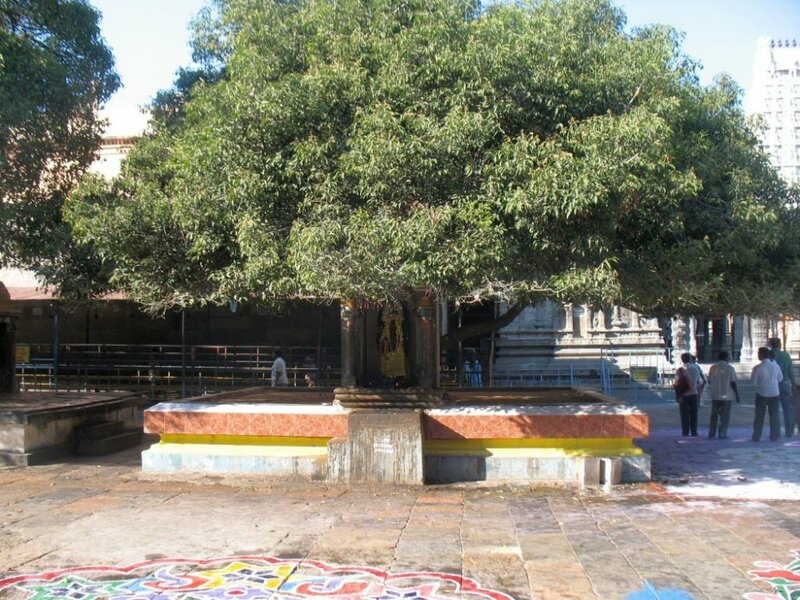 It could be said that because of its central location, that this tree (species Mimosops Elengi—Magadam Pu in Tamil) is now regarded as the Sthala Vriksha, or Temple tree. There are three such trees, and one of these may be about a couple of centuries old. Devotees hang boon cradles made from cloth and sometimes wood, from branches of the tree, when seeking the blessings of Lord Annamalaiyar (often) for the boon of a child. 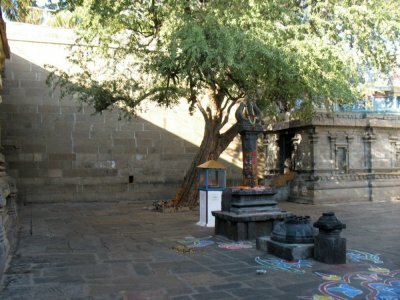 Amongst the trees on a raised platform are shrines of Sri Dakshinamurti, an image of Lord Ganesha facing east and a four-pillar open shrine of Sri Jambu Keswarar Linga. 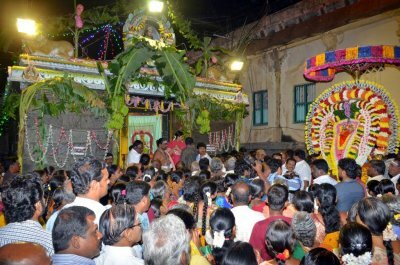 During the Vasantha Utsavam the inset Siva Lingam is submerged in water and amongst floral decorations during that Festival, the Lingam appears to be floating. Between these three trees and the wall of the fourth enclosure there are about four stones in the pavement with inscriptions on them. One among them bears on it the insignia of the Vijayanagar Kingdom, via., Boar and Dagger. These stones may have found their way here during the extensive repairs funded by the Nattukottai. On the wall opposite, about 10 feet from the ground, there is a panel containing the statuette of a Thambiran; other panels in a line depict the occasion of the Thambiran reviving the dead horse of the then Chola King, which evidently died of snake bite. The snake is also shown in the panel. 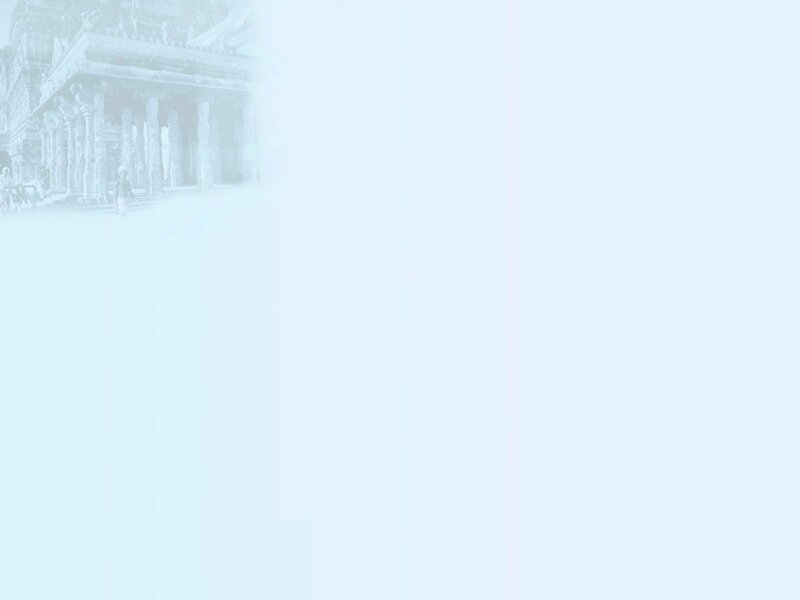 Below these there is another statuette, in a niche, and it may be the representation of the disciple of Thambiran. 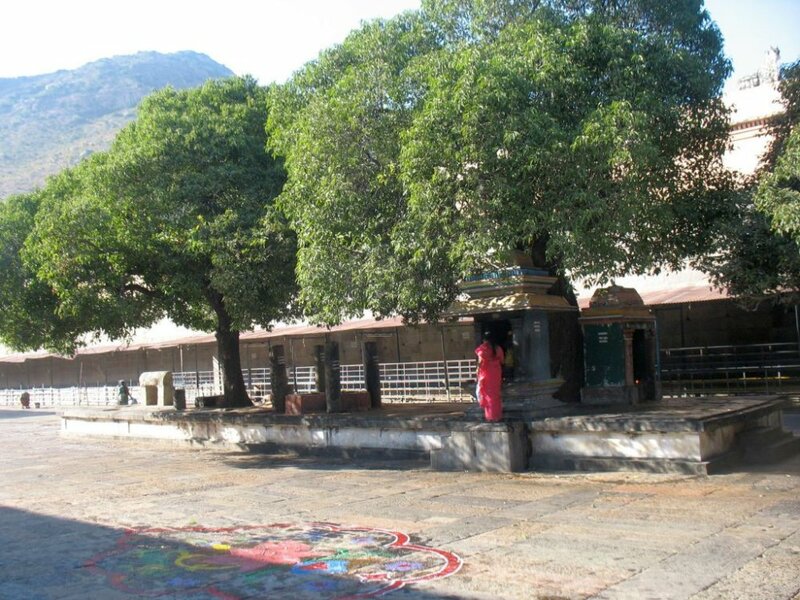 Standing next to the platform with the trees there is a circle (which has been marked on the ground) from where it is possible to view all nine Gopurams of Arunachaleswarar Temple. For more information visit this link here. This hall (Tirukkalyana Mandapam) is situated in the south-west corner of the third Prakaram. It is here that the Gods are installed during Festival days. It was initially constructed by the Vijayanagar Emperors and later renovated by the Nattukotai Chettiars. 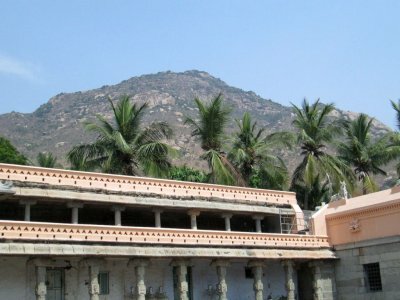 On the ceiling and walls there are paintings of stories from the Arunachala Purana, the Epics, figures of God, animals and nature. 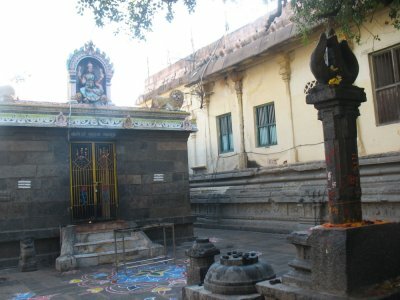 In the east of this mandapam is situated a small Vinayakar Shrine. This is located inside the Kalyana Mandapam. 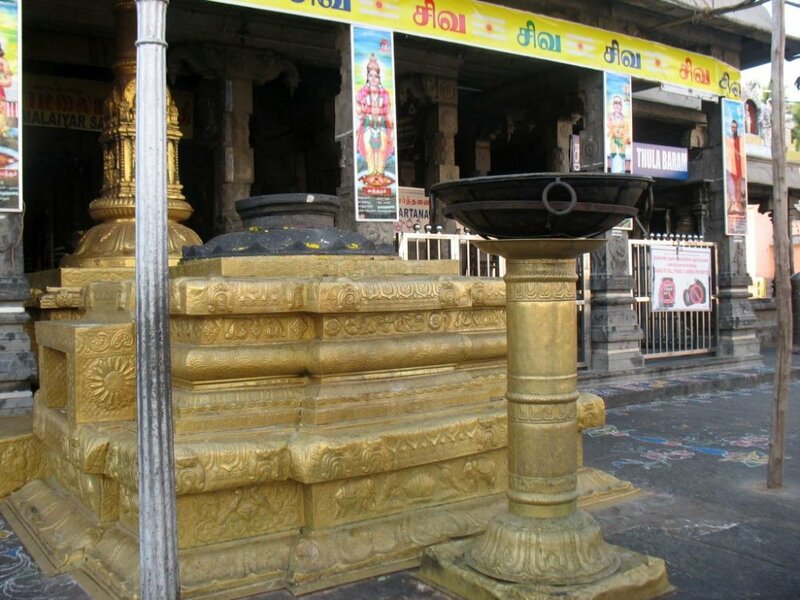 The ancient Bheemeswara Lingam Shrine has been at Arunachaleswarar Temple for centuries. 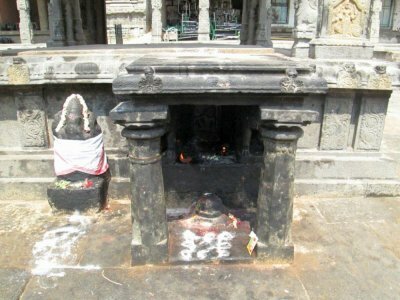 Some say that Lord Bheema (who represents knowledge—jnana) worshipped Lord Siva at this sacred spot. This mandapam is located in the West opposite the Pey Gopura. This mantap or seat is dedicated to Arunagiri Yogi, who is represented by a figure on a stone slab facing east. This seat is dedicated to the Siddha Purusha on Arunachala Hill. Tradition has it that from underneath this mantap, there is an underground passage leading to the other side of Arunachala Hill and to Adi Annamalai Temple. 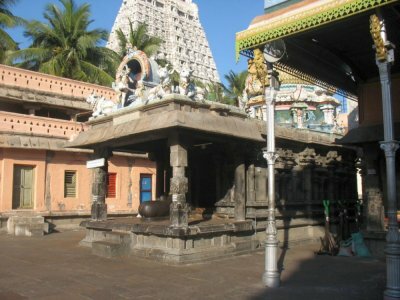 Vinayagar and an image of Yogiswara are also found in this shrine facing east. 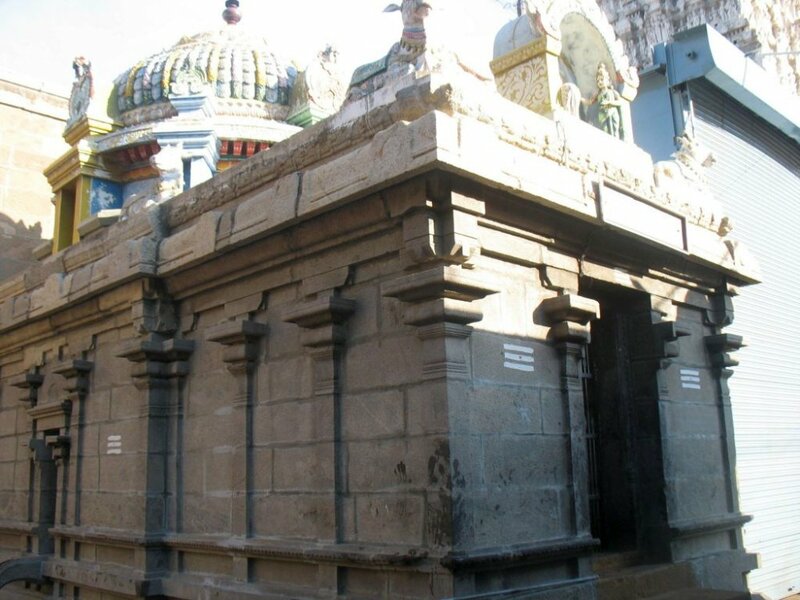 The separate structure of the Temple of Unnamulaiamman has been erected in the northwest corner of the third Prakaram - it is (as expected) to the left of Lord Siva. 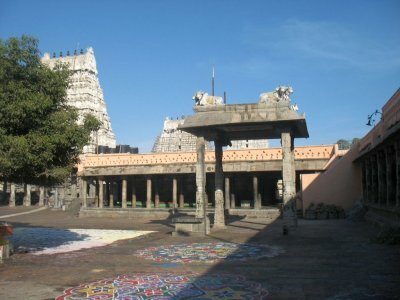 The Amman Temple is situated in the northwest corner of the Temple compound. The wall of the Amman Temple is about 10 feet high. The emblem of Hoysala, (the Kandaperanda Bird) is found and nearby there is also a statue of a standing man with worshipping hands. The standing man is identified as Ballala. Hence it is presumed that the outer walls might have been built by the Hoysala King. 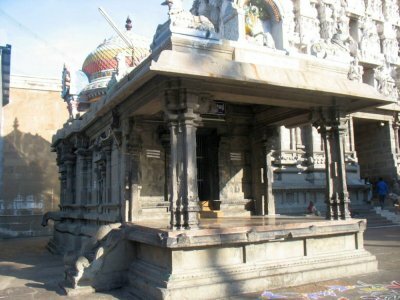 Left to the open doors leading to Mother’s Shrine is Vijaya Raghava Vinayagar in seating pose. 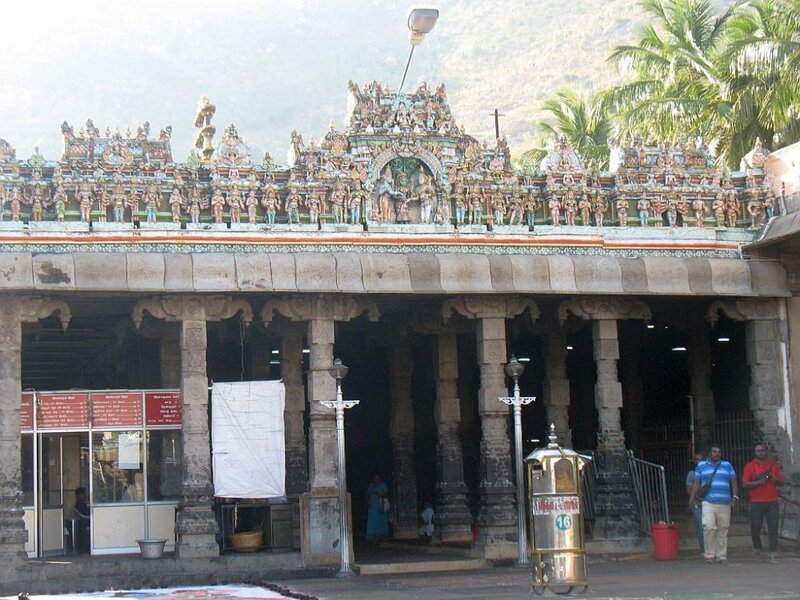 To the right of the doorway is a row of nine statues; Vinayaka, Lingabhavamurti, Ganapathi, Bhairava, Linga, Valli, Shanmugan, Devasena and Dakshinamurti. Two large Dwarapala Guardians flank the open door leading to the Inner Shrine—a Nandi faces inward towards the Mother’s Shrine. The Dvarapalakas are armed with Gadha, exhibit Tarjani mudra and have a Crown. All round the sanctum and in the antara are five Sakti Ammans in ghostas, each image is approximately 1½ tall. After passing through the doorway one enters a large mandapam facing the Shrine of the Mother. In front of the entrance to the inner shrine there is a second Nandi and on either side of the Goddess her two sons; Vinayaka and Karthikeya guarding the entrance. Pillars representing the Ashta Lakshmis extend from the entrance doors to the Inner Shrine. 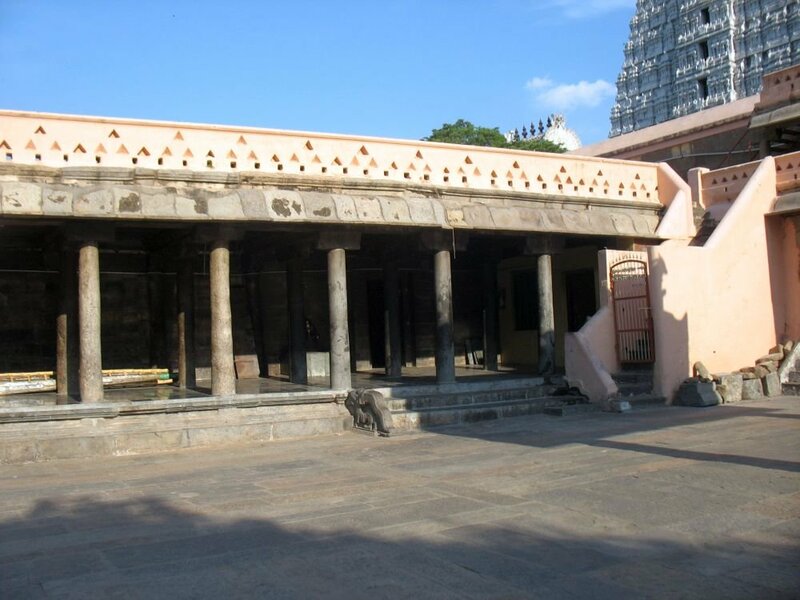 Because of the Ashta-Lakshmis (eight Lakshmis), this mandapam is known as the Ashta Laxmi Mandapam. In the north-eastern corner stands the sacrificial pavilion used during the thirteenth century onwards, with an opening on each of its four sides as in the Vedic sacrificial pavilions, which were light structures to be burnt after sacrifice was completed. 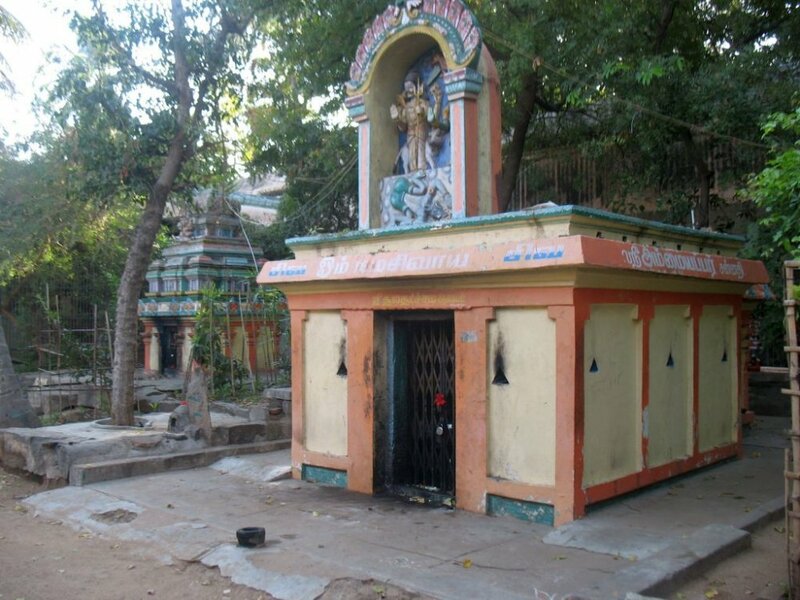 In the prakaram around this sanctum the festival idol of Vinayaga, Somalinga, Cheralingam, Brahmi, and Durga are housed. It can be inferred from inscriptions dated 1180 A.D. during the region of the Chola King Kulothunga III, that there was a Shrine to the Goddess (at Arunachaleswarar Temple), called Thirukkalakotam. The Navagraha Shrine, the Kodemara Mandapam, the Astalakshmi Mandapam and the Sanctum Sanctorum are important structures of the Unnamulai Amman Temple. The Devi temple and the mandapam in front of it are quite modern, remodelled by the Chettiars in the last century. It seems the Devi’s temple was on a lower level than that of the Siva temple and there existed a flight of steps leading down into the shrine. Now the shrine is on the same level as that of the other shrines. Inside this shrine, is a colonnade of carved pillars and the prakara is covered with stone roofing. The image of the Devi’s Shrine is believed to date from the 11th century. In the mandapam in front of the Devi’s shrine is the Flagstaff, Nandi and a shrine dedicated to the Navagrahas which is held in great veneration by devotees, who light lamps and go round the Shrine in order to propitiate the evil influence of the planets. Near the Shrine to the nine planets are shrines dedicated to Yama (the Lord of Death) and his secretary-bookkeeper, Chitragupthanar. 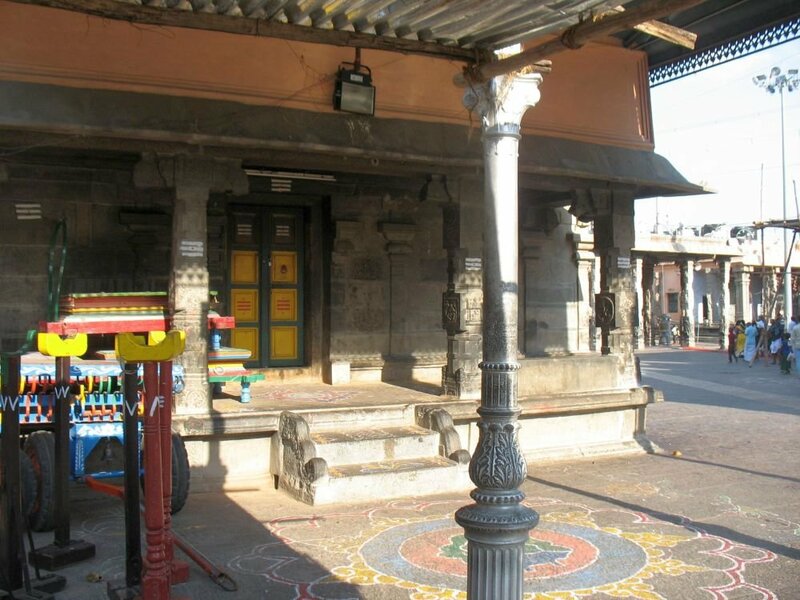 The Vasantha Mandapam used to be known as the Kolu Mantap, and was built by Vena Odeyan in 1230 A.D. This Mandapam has walls on the rear and in the front. It stands on a plinth. The rear portion is supported by four rows of pillars, six pillars in each row in an east-west direction form a rectangular part in the middle and is supported by one pillar on each side in the centre. 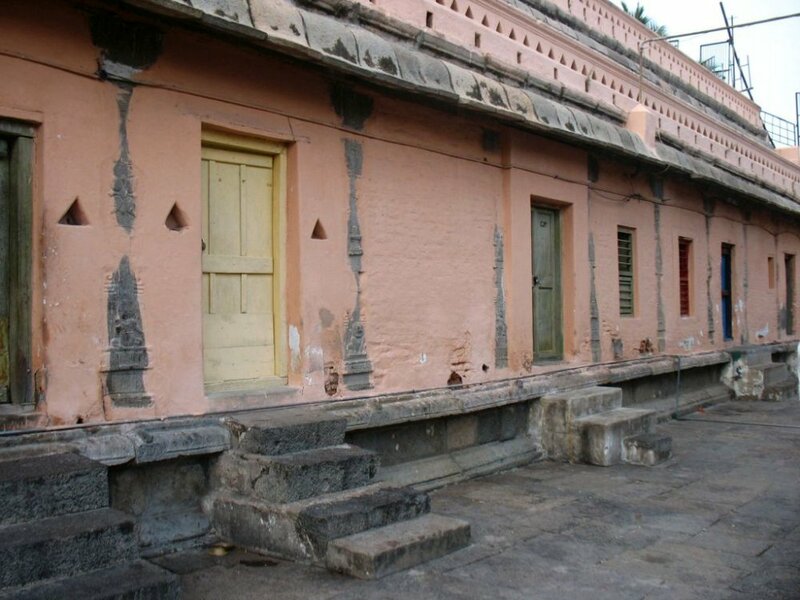 This building used to be the central office for the Temple Devasthanam, which has now relocated to offices located in the Puravi Mandapam of the Fourth Prakaram. 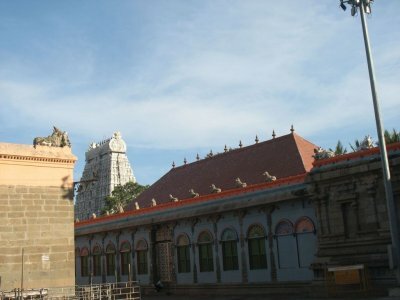 To the east of the Unnamulai Temple, there is the Kalahasthiswarar shrine facing west. It has a garbhagriha and antarala. A small mandapam is in front of the antarala supported by four pillars. The exterior surface of the walls contain pilasters and over the garbhagriha, there is a Nagara Vimana. The Nandi located in the front mandapam—is of particular interest as that statue is very long with short horns. Including the adjacent quadrangle, there are a total of four shrines which represent the elements. 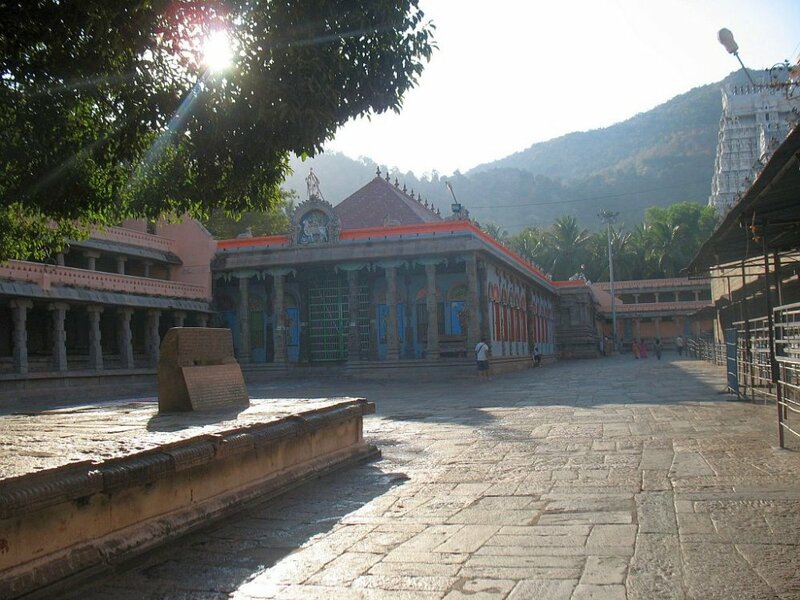 The Kalahasthiswarar Shrine stands for the element Vayu (air). 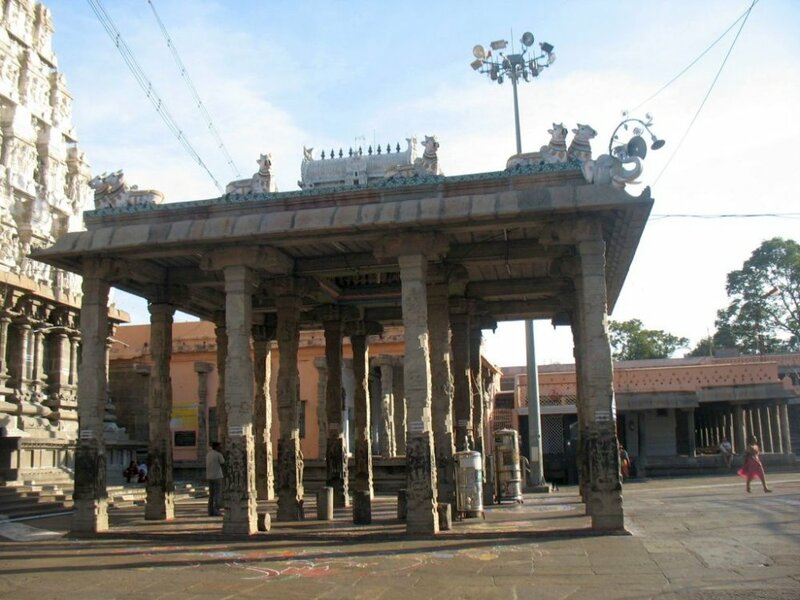 The Yagasala Mandapam is situated to the southern side of the Kalahasthiswarar shrine. It has open mandapam supported by four pillars. The plinth shows upapitha, kanta and kapota parts. 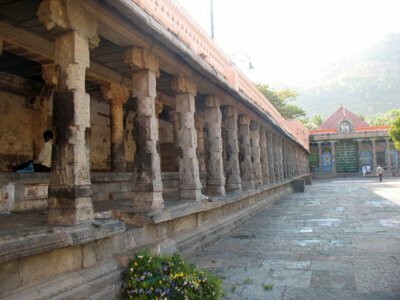 The mandapam has eight pilasters on the northern, eastern and southern sides. At the centre of each side there is a window of holes. This Yagasala was built in 1944 and is used during the four ten day Festivals celebrated at Arunachaleswarar Temple. 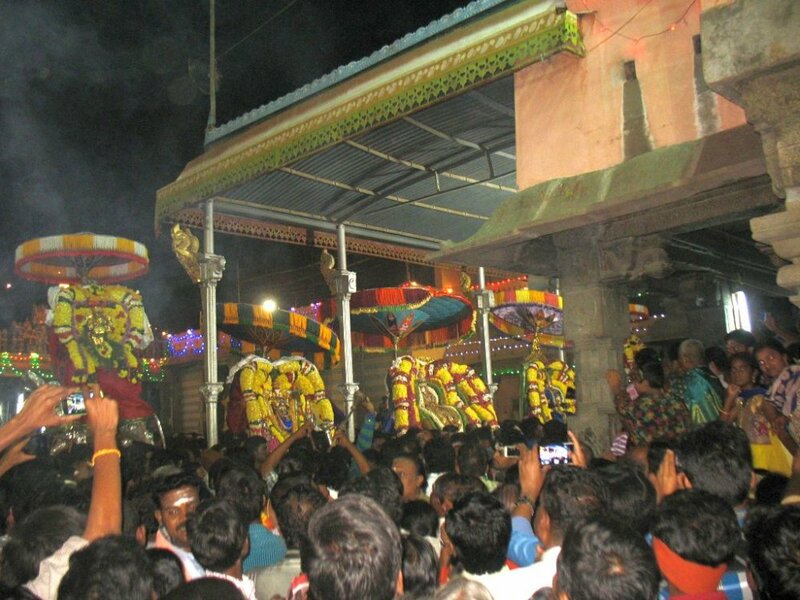 During the Grand Festivals at Arunachaleswarar Temple, alangaram is performed at the Kalyana Mandapam. 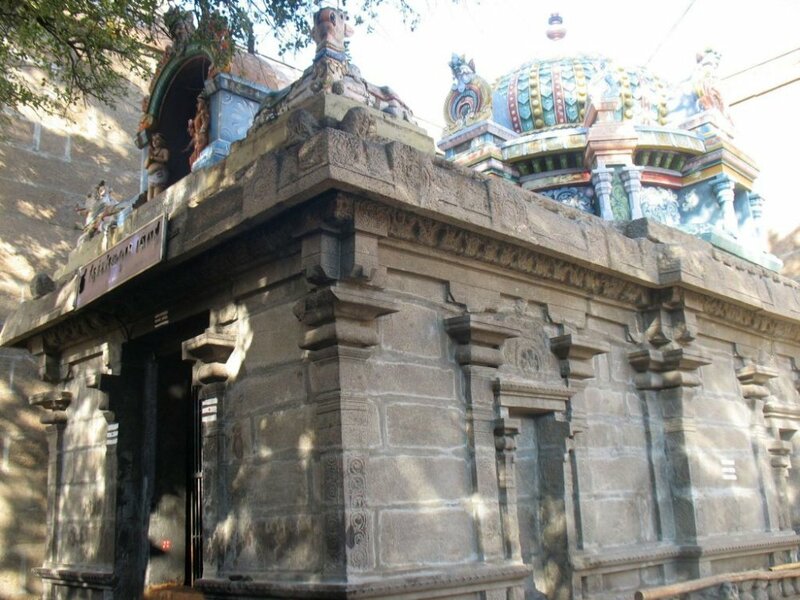 The Gods then leave by the front door of that Mandapam, perform circumambulation of the Siva Sannidhi and then stop at the Yagasala Mandapam for adornment and aarthi performed by the priests. The modern shrine of Pidari, housing the tenth-century “Seven Mothers” (which originally stood in the second enclosure), is a perfect example of how Temple life has changed over the centuries. In fact, when worship of the “Seven Mothers” declined after the end of the Chola period, their images were often removed from Siva Temples and installed in small village Temples under the name of a single deity who functions as the village Goddess. In this capacity Goddess Pidari presides over orthodox Brahmin Temple festivals, giving protection by touring villages before the first day of the festival. 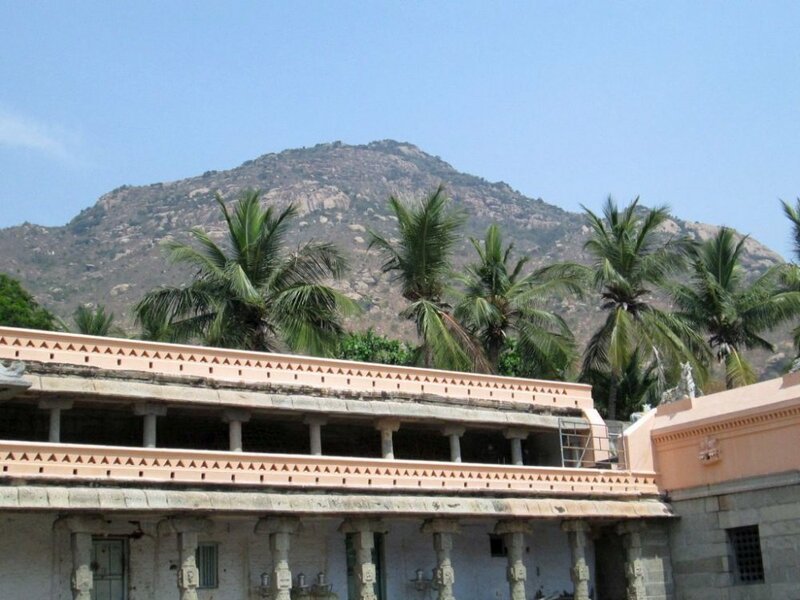 The unusual feature at Tiruvannamalai is that Goddess Pidari is found within the great Temple itself, and that new images of the “Seven Mothers” were provided for the second prakaram at a later date. In front of the Pidari shrine, which faces North, there is a stone trident and two Bali peethas or sacrificial altars. At this place there is also an ancient Bilva tree—from this tree “pittu munn” (i.e. 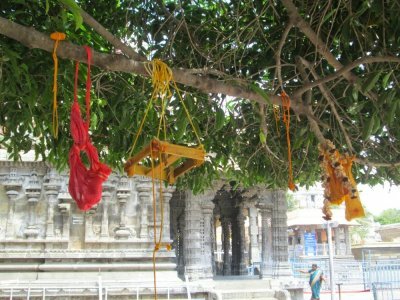 small amounts of soil) are taken from the ground around the tree’s trunk and used in rituals during the Grand Festivals of; Uttarayana, Dakshinaya, Karthigai and Margazhi. After such rituals the earth is then immersed in the tanks of the Sivagangai Teertham, Iyyankulam Teertham, Brahma Teertham and Tamari Kulam. Inside the Pidari shrine are representations of; Ganesha, Sapta Kanyas or seven ‘Matris’ (chiselled in separate stones), a severed head of a Goddess with a crown and Nidambasudani who gives darshan with eight arms. 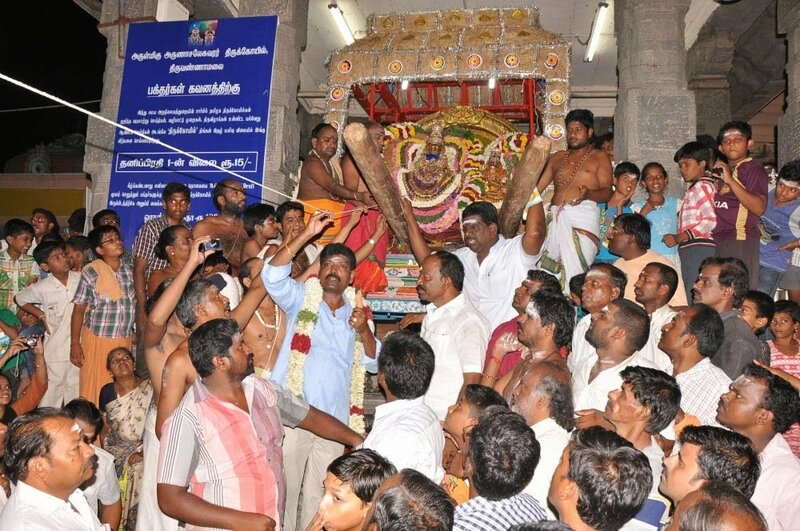 This severed head represents ‘Renuka’ the Goddess worshipped at Padaiveedu, a town about 30 miles from Tiruvannamalai. Renuka represents the ‘Formidable’ the ‘Fearful’ aspect of Kali, the consort of Siva. The stoned head of ‘Reunka’ is about 2½ high and although it has a slightly damaged nose, is a very beautiful image. Goddess Pidari is Kali in a rural setting and regarded as being a consort of Siva. Pidari is the ferocious aspect of Amman. The Mother Goddess gives life but Kali takes life. Goddess Pidari is the feminine form of Kala—time. Kali is the energy or the power of time. Her blackness swallows all that exists and the emptiness of space is her clothing, for when the Universe is dissolved, the power of time remains without maya (veil). Kali’s extension, Pidari and her worship; evolved as a fighter and warrior and gained importance with the influence of Tantrism where she is known as Kala Pidari. The Pidari Goddess, in line with Shakti manifestations, emphasises fierce symbolism. At times Pidari is the sole resident deity in a village. As devata, She is the all-in-all for the village from simple prayers to Divine blessings. She also watches over the main deity of a Temple in her role as ‘kaval deivam’ while taking her seat in a structure on the right hand side of a Temple’s entrance. She joins the ‘kavaldeivam’ or Protection Gods’ similar to that of Ayyanar, Muniandy, Karuppana Swamy or Veerabadhra, all of whom are warrior-protection village gods. Pidari shares Kali’s attributes and is depicted holding a noose, trident, skull cup and a pointed knife. The noose is sometimes replaced by ankusha – the elephant goad. The damaru that she holds is entwined by a snake, thus sharing Siva’s characteristics. She has flaming hair and three eyes. She has a terrifying appearance with long incisor teeth to frighten off evil spirits. She is sometimes synonymous with Goddess Mariamman and lime strung as a garland – ‘elumichai malai’ is well favoured by Her. Goddess Pidari is also represented by a simple stone image called ‘veerakkal’ symbolising courage and venerating ‘veerarghal’ – the warriors. It is believed that Pidari is the combined form of Lord Siva and Shakti. ‘Adanghaa Pidari’ is another Tamil description of Goddess Pidari. ‘Adanghaa’ means ‘one that cannot be controlled’ implying, Pidari, once provoked does not soon subside Her anger. An example of her famed anger is found in the famous legend of Daksha’s yajna. In this legend her father Daksha ignores Lord Siva. Dhakshayani attends the yagna and feels vexed to see that her father has invited all Gods including Vishnu and Brahma, but has ignored and insulted Her Lord Siva. For this, Dhakshayani enters the yajna fires after cursing her father Daksha. Narada carries the news to Lord Siva and the Great Lord shakes the earth. Sweat from his body falls down and Lord Veerabhadra and Pidari Badrakali emerge from it and are ordered to destroy the yajna and kill Daksha. Which they do but upon the intercession of the Devas and Gods (who beg for Daksha’s life) the head of a goat is attached to Daksha’s body and he is revived and thereupon begs forgiveness from Lord Siva. 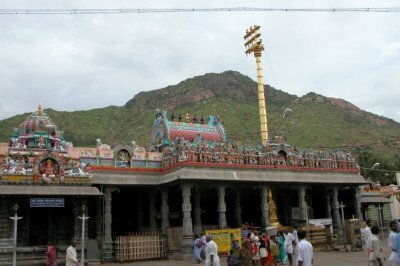 This particular Pidari Temple is highly significant in that it plays a part at the beginning of the Karthigai Festival. To read more, view this link here. Previously mentioned is the Kalahasthiswarar Shrine which stands for the element Vayu (air). The other Shrines connected with the elements, are located in a quadrangle with the Pidari Shrine. These shrines represent the five elements viz; Chidambareshwar for Akash (Ether), Kalatheshwar for Vayu (Air), Jambukeshwar for Water; Ekambareshwar representing Earth and the fifth representation of the elements is our own Arunachaleswarar, as Fire. The Chidambareshwar Shrine represents Akash (ether). The architecture of the Chidambareshwar shrine appears older than that of the others and it must have been built in the 9th century. Whereas, the other three Shrines appear to have been built in the 10th century A.D.
“The very thought of Tiruvannamalai will bring salvation. 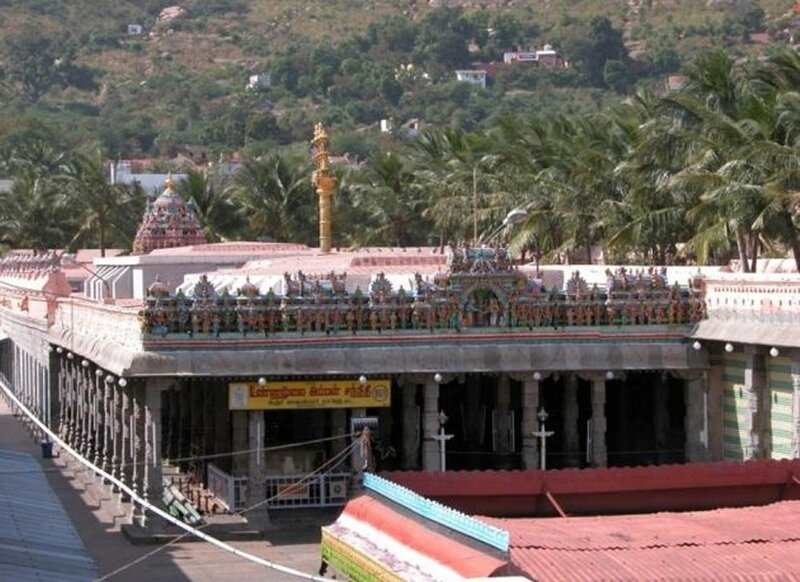 The Sthalapuranam says that one can attain salvation by being born in Tiruvarur, by meeting with death in Varanasi (Kasi), by worshipping at Chidambaram and by mere thinking of Tiruvannamalai. 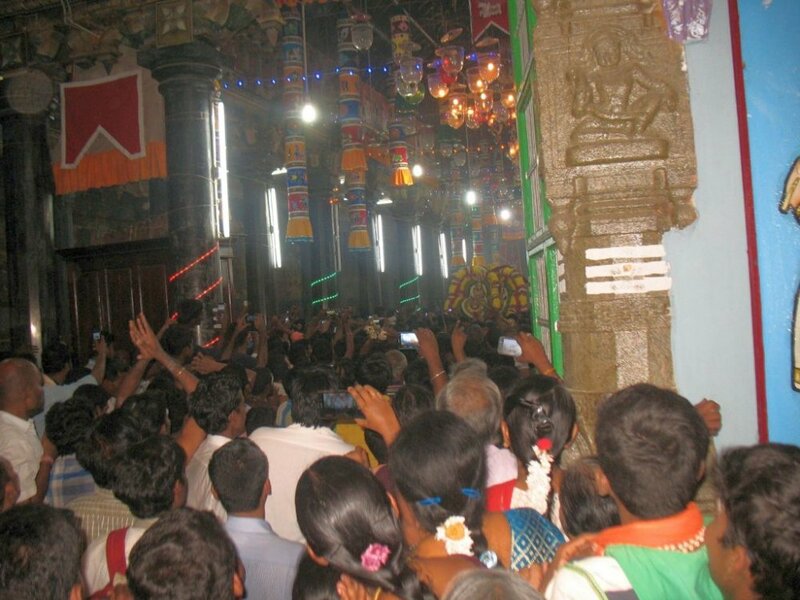 So we find in Tiruvannamalai the easiest way to salvation. The Jambukeshwar Shrine represents of the five elements-Appu (Water). The Ekambareshwar shrine in the Arunachaleswarar Temple Third Prakaram, represents (Earth). On the back of the Ekambareshwar shrine there is a beautiful representation of Lingodbhava or Adimudi. 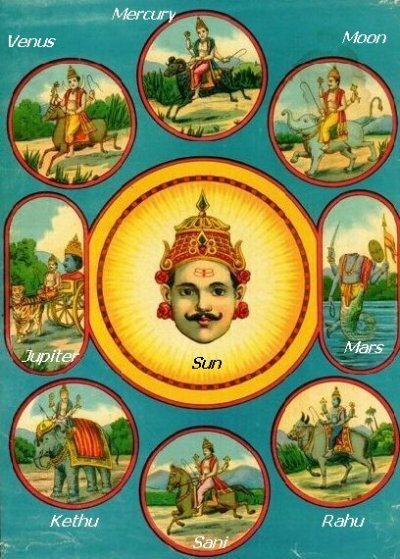 The five elements of the Universe are earth, water, fire, air and ether and the Sastras call them the Pancha Boothams. These five elements are represented by five sacred shrines or the Pancha Bootha Sthalams of which Tiruvannamalai is one. 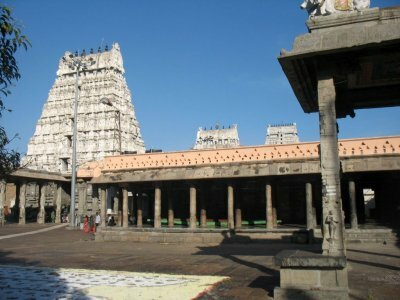 Prithvi (Earth) Sthalam is Kancheepuram; Appu (Water) Sthalam is Tiruvanaikaval; Theyu (Fire) Sthalam is Tiruvannamalai; Vayu (Air) Sthalam is Kalahasthi; and Akasa (Ether) Sthalam is Chidambaram. Of the six Athara Kshetrams, Tiruvannamalai is said to be the Manipooraga Kshetram. It is also one of the Saivite Shrines sung by the great saints Appar, Sundarar, Sambandar and Manikkavacakar.